Tax and Accounting Updates from the Leaders in CPE and Training: Bitcoin: The New Electronic Money? Bitcoin: The New Electronic Money? Direct TV and Dish TV have just recently announced that they will begin accepting Bitcoins as payment for their TV subscriptions. So just exactly what is a Bitcoin? 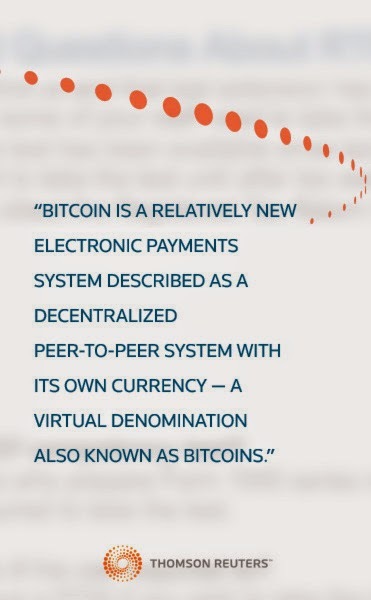 Bitcoin is a relatively new electronic payments system described as a decentralized peer-to-peer system. Unlike other electronic payment systems, such as PayPal, it also has its own currency — a virtual denomination also known as Bitcoins. Bitcoins are known by various names including virtual currency, electronic money, or crypto-currency. The Bitcoin system is driven by a concept called block chain, a public record of all transactions carried out within the Bitcoin network. The transactions are recorded in a public record that is collectively maintained by everyone who uses the currency. Bitcoins are stored in a digital wallet when they are received. The wallet can be cloud-based or on a local system to maximize security. Who created Bitcoin? A person calling himself Satoshi Nakamoto, published the rules to the Bitcoin portal in 2008. The network was launched in 2009; however, no one really knows the true identity of Nakamoto. How to create (earn) Bitcoins. According to Wikipedia, “Bitcoins are created as a reward for payment processing work in which users who offer their computing power, verify and record payments into a public ledger. Called mining, individuals engage in the activity in exchange for transaction fees and newly minted Bitcoins. Bitcoins can also be obtained in exchange for products, services, or other currencies. No charge when making payments in Bitcoins, either locally or internationally. Eliminates credit card fees for processing transactions. Difficult for anyone to make fraudulent payments using bitcoins. Has its own currency and is not controlled by any central authority. Has a volatile valuation. The price of a single Bitcoin has ranged from$13 to $1,000. Exchanges are a tempting target for hackers. Can be lost, or destroyed. Audit considerations. From an audit perspective, Bitcoins are basically the same as any other foreign currency. However, teams auditing clients with Bitcoins should include an IT specialist to verify the Bitcoin balances. Verification should include traditional confirmation letters to third-party wallet holders and verifying balances from the block chain. Once the amount of Bitcoins at the balance sheet date has been determined, the auditor needs to verify that the amount is properly translated into the company’s reporting currency in accordance with FASB ASC-830-20-25. The currency translation from Bitcoins to dollars is accounted for through an adjusting entry that includes the gains and losses reflecting changes in the exchange rate between Bitcoins and dollars. The same translation calculation must be made for receivables and payables that the company expects to settle in bitcoins. The future. No one knows exactly what will come of the Bitcoin system but it is probably not going to disappear any time soon. However, there is no doubt that it will have a far-reaching impact on how money is dealt with online. Great insights regarding Bitcoin. Bitcoin is a form of digital currency, created and held electronically. No one controls it. Bitcoins aren’t printed, like dollars or euros – they’re produced by lots of people running computers all around the world, using software that solves mathematical problems.